Parsley, a member of the carrot family, is a lot more than a decorative green bit on the side of your restaurant platter. The Greeks and Romans knew parsley well as a seasoning and as a medicinal plant. In fact, it is one of the most nutritious of all herbs. An excellent source of vitamins A and C, it also contains niacin, riboflavin and calcium. Because it is rich in chlorophyll, parsley also makes an excellent breath freshener. Both the French curly and Italian flat-leaved parsley types are ideal for garnishes and for flavoring soups, stews, salad dressings, and sauces, but the flat-leaved variety is said to have the best flavor. Parsleys are also useful as ornamental plants. Their feathery leaves make them attractive as annual border plants and as container plants. Parsley is a biennial, but is usually planted annually. 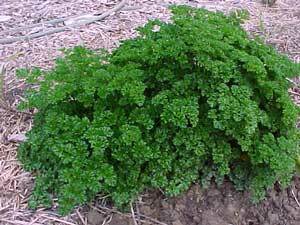 Size: A curly parsley plant typically grows 9 to 18 inches tall and spreads about 6 to 9 inches. The Italian type may grow to 3 feet tall. 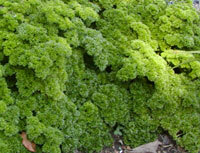 Foliage: Parsley leaves are a clear dark green color. They form in groups of three at the ends of 6 to 8 inch long bare stems. Leaflets of common parsley have divided tips which curl. Those of Italian parsley are more deeply divided and feathery, resembling celery foliage. Flowers: As biennials, parsley plants bear flowers in early summer of their second year. They are flat clusters composed of tiny, greenish yellow florets, and resemble Queen Anne’s lace. They are seldom seen because parsley is usually treated as an annual and plants are pulled up at the end of the first season. As with most herbs, leaves tend to be bitter if plants are allowed to flower. However, the parsley flower hosts many beneficial insects. With its dense green, low growing feathery foliage, parsley serves best in the landscape as well as in the formal herb garden as a border plant for planted beds. It also makes a good container plant. Use it with colorful annuals in a windowbox or planter or combine it with other herbs for a mini herb garden. Because they develop deep tap roots, it is best to transplant full-grown parsley plants into containers that are at least 12 inches deep.